Boers-Li Gallery is pleased to announce Brush and Beyond, a group show of rarely-exhibited and ardently sought-after paintings and drawings by Wu Dayu (1903-1988), Yu Youhan (b.1943, Shanghai), and Zhang Wei (b.1952, Beijing). The show will open on Thursday, March 15th at our New York location. 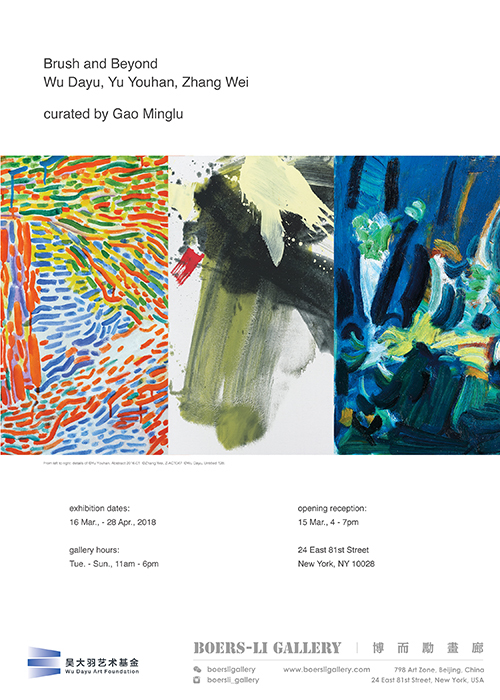 Curated by the scholar Gao Minglu, this exhibition presents a study of the evolution of mainland Chinese abstract painting, and embodies a dialogue between the tradition of Chinese ink and that of Western oil painting. 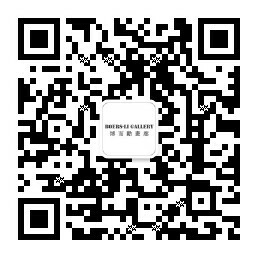 Internationally-acclaimed painters in their own right, Wu Dayu, Yu Youhan and Zhang Wei represent three different conceptions of early abstract painting that anticipate more recent waves in Chinese contemporary art. Brush and Beyond brings together for the first time Wu Dayu’s intimate oil paintings and works on paper from the 1950s, 1970s and 1980s, and more recent pieces by Zhang Wei and Yu Youhan. Foregrounding abstraction as subject matter, the paintings on view portray images forged upon the artists’ living experience and their reflection on the relatedness between these two major painting traditions. From the perspective of the East, the three artists push the boundaries of painting as a universal and visual language by means of its materiality. The techniques themselves invite the viewer to a shared aspiration towards freedom, creativity and individuality; resistance to order and liberation from legibility, while challenging the impulse to rationality. A highly-respected forerunner, Wu Dayu realized his non-representational paintings with exuberant colors and rhythmic compositions on poetic terms. Recalling well-articulated modernist practice, Wu’s paintings bear traces of surreal landscape, distorted figuration, and blown-up still life. This, according to Zhang Wei, is the signature style of Wu – a painter’s painter. Fastidiously and rarely exhibited in the West, the works on view are selected directly from the recently published estate. Yu Youhan’s iconic, widely celebrated “Sphere-Series” presents a worldview that is, at once, macroscopic and microscopic. While one identifies the shapes of bridge, waterfall and tree contained within the circle, meticulously-applied strokes in rhythmic formation make tangible the forms of life and energy coexisting in the world. Here, the Taoist proverb: The one bears two; the two bear three; the three bear the tenthousand things; finds its way into a representation of difference and repetition. Coalescing emotion and gesture, Zhang Wei’s paintings traversea fine line between improvisation and control, movement and containment. With Zhang’s broad cursive strokes, striking splashes of paint, an audacity in applying two to three colors on canvas, the work is energetically impacted to create a visual tension. Zhang’s fortuitous, dynamic application of paint, either with a brush or dashed directly onto the canvas maintains the moment of the work’s execution. A tension arises from his canvas, built up between expressive strokes and undefined areas filled with contemplative stains, testifying to an emotional state of artistic autonomy. Among the first-generation Chinese artists who sailed for Paris in the 1920s, Wu Dayu studied Painting as well as Sculpture with Antoinette Bourdlleat L’ÉcoleNationaleSupérieure des Beaux-Arts, and found himself immersed in the avant-garde - Picasso, Matisse and many others. Returning to Shanghai in 1927, Wu taught at the National Academy of Art in Hangzhou at the invitation of Lin Fengmian who had also just returned from Paris himself and co-founded the academy. Among Wu’s students were the later-renowned painters ZaoWou-Ki, Chu Teh-Chun and Wu Guanzhong. In the midst of political change, Wu Dayu maintained a distance from institutional ideologies, viewing art as the embodiment of truth, integrity, and faith. In order to save his free-spirited works during the Cultural Revolution, Wu kept them out of public view until the late 1980s; thus, his late paintings are mostly small-scale, and many went missing or were destroyed. Nevertheless, Wu left behind about 2000 pieces: 150 oil paintings and many works on paper, none of which is signed or dated. Yu Youhan was born and raised in Shanghai in the 1940s, just as the Communist Party and Mao were coming to power. The Cultural Revolution turned his supposedly five-year training at the Central Academy of Art and Design into eight years, including one-year of formal education and several group expeditions to rural China. A witness to the Maoist era from beginning to end, Yu remembers his childhood and living environment as inseparable from Mao’s portrait. Learning about Western modern art mostly through reproductions, Yu started privately painting post-impressionist landscapes and portraits during the Cultural Revolution, and moved on to Klee-like abstraction in 1979. In the early 1980s, paintings by Wu Dayu and Zao Kou-ki caught his attention as he was exploring the possibilities of abstract painting. After experimenting with abstraction in the 1980s, Yu created satirical imageries of Mao, which became his most-renowned works, often labeled Political Pop. Not until recently has Yu returned to abstraction and come to terms with the core of his practice as a painter. Some Beijing liberals, born into a younger generation, found the social repression of the Cultural Revolution enticing. Although it was against the law at the time, they made outdoor sketches of their surroundings. In this manner, Zhang Wei started painting in the early 1970s. These underground, self-taught artists later came to be called the No Name Group. In the early1980s, taking a stand of resistance, Zhang and his friends became the first oil painters in China to experiment with abstract painting methods. This was the birth of the first wave of experimental abstraction in China. In 1986, Zhang Wei, along with many of his colleagues, moved to New York to pursue their careers. Zhang returned to Beijing in 2005 where he has executed an abundant and unequaled series of abstract paintings.